This is your fourth gold medal for winning the World Chess Olympiad. Which of them did you find the toughest? You don’t get gold medals easily. When I made my debut in 1988 for the USSR team I wanted to perform better. After that I was leading a team, so there was even more reason why I couldn’t take things easily… In general, going into an encounter I always try to win. Sometimes it doesn’t go according to plan, but you won’t find short draws among my games. How do you prepare for events now? How did you prepare for the Olympiad? There are a number of elements in the preparation for any tournament – there’s pure chess preparation, getting into good physical shape, and an appropriate mental attitude. We had a training camp near Kiev, and at home I often had a tennis racket in hand and went to the tennis courts. I got great pleasure from playing tennis… The events in Khanty-Mansiysk took place in the Sport Centre on tennis courts, and I saw that as a good sign – I hadn’t played tennis in vain. The hotel was located almost in the forest, and I often went to breathe in the fresh Siberian air and watch as lively squirrels would jump from branch to branch. That brought calmness to my soul and my thoughts, and helped me to concentrate on each game. It was possible to follow your games on the internet. The greatest impression was made by your game with the Georgian chess player Jobava: you lured his strongest piece into your camp and imprisoned the black queen on the first rank with your minor pieces. You don’t often get such final positions in grandmaster games. I recently succumbed to Jobava at a tournament and tried to get my revenge. I managed to drag my opponent into a position that brought me success. Has your successful performance at the Olympiad allowed you to increase your rating? 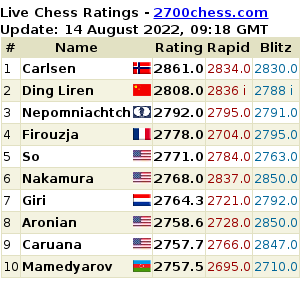 Yes, my preliminary estimate is that on 1 November I’ll reach the 2772 mark, which puts me in the top six in the world. I’m also going to play in a few more tournaments before the end of the year. Did you follow the women’s tournament at the Olympiad in Khanty-Mansiysk? I didn’t look into it very closely, but I knew the results. It’s a shame our girls didn’t have more luck at the end, as they could have been among the medals. However, it’s nice that the 18-year-old Mariya Muzychuk, making her debut in such responsible competitions, managed to post the best result among the reserves. Six years ago in Calvia, when Ukraine also became champions, another grandmaster from Lvov, Andrey Volokitin, also appeared in the winning team. Why wasn’t he in the line-up this time round? Andrey was in the list of candidates, but the head trainer, Vladimir Tukmakov, decided to take Alexander Moiseenko from Kharkov. If there had been two reserves, as before, then Volokitin would have been in Khanty-Mansiysk. But he’s still, as before, part of the wider team set-up. At the moment the highest titles are held by chess players from your generation who are over 40 years old. Vishy Anand is the World Champion, Boris Gelfand is the World Cup winner and Vassily Ivanchuk had the best result at the Olympiad. Do you feel your younger opponents “breathing down your neck”? Which events will we see you at in the near future? The European Club Cub is about to start in Bulgaria, and I’m going to play there for a team from St. Petersburg. Then there’s a rapid chess tournament in France, and so on… Such is the life of a chess professional: today one place, tomorrow another. And to end… What, when it comes down to it, is chess for you? I consider chess to be not only a sport, not only an art and not only a science. It’s a model of sorts for life, a method of thinking, a perception of the world, which for us chess players is a little different than for other people. Perhaps that’s why people look at some of us as eccentrics, but it’s something you need to grasp. Nice interview. Good to know Ivanchuk looks forward to becoming even stronger. His devotion to chess comes through in his words. Chess means so much to him, which is why he is such a popular player with fans! Ivanchuk and other members of the Ukrainian Olympiad team – Eljanov & Moiseenko – are in the studio, and there are also interviews with e.g. Eljanov’s wife and Ponomariov’s father. 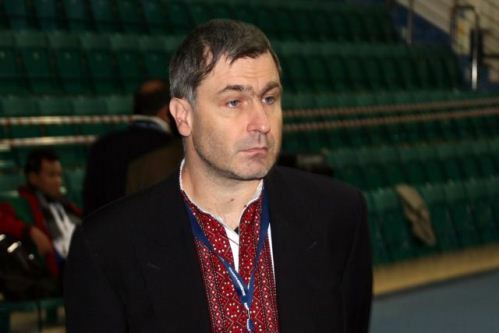 It’s in Russian and Ukrainian (Ivanchuk and the presenter speak Ukrainian and everyone else speaks Russian…), but it might still be worth a look. For example at 5:57 you can watch Ivanchuk doing his shopping in the market by the station in Lvov :) or at 40:23 he’s talking about how lots of his ideas came when he was at church.